Illinois requires supervisors of food service establishments and non-retail food service establishments be certified in food protection. This means a person-in-charge, an owner, or manager of a food establishment – (i.e., restaurants, bars, cafes, bakeries, delis, mobile vending, food trucks, assisted-living, day care centers, and convenience stores) become certified by taking a approved food manager training course and successfully passing an accredited food manager certification exam. The Illinois Food Handling Regulation Enforcement Act (410 ILCS 625), amended by SB1495, passed into law on August 27, 2013, established new requirements and changes to existing training and certification for Illinois Food Safety Managers. A Certified Food Service Sanitation Manager is to be on duty at all times when potentially hazardous food is prepared or served. This person is responsible for overseeing the food handling and preparation process to prevent the occurrence of food-borne illness. The Food Service Sanitation Manager Certification program is administered by the Department of Public Health and other approved training providers. This program is designed to offer food handlers and supervisors a basic food science background and develop knowledge for the proper handling of food and the unsanitary maintenance of food establishments. 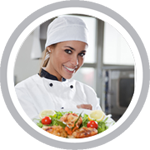 The Food Service Sanitation Manager Certificate must be posted prominently and should be in plain view of customers. We offer online HACCP Training in Illinois for: Chicago, Aurora, Rockford, Joliet, Naperville, Springfield, Peoria, Elgin, Waukegan, Cicero, Champaign, Bloomington, Arlington Heights, Evanston, Decatur, Schaumburg, and many more!